There are many holiday gift ideas waiting for you right outside your door in the garden! Use Plants and Recycled Materials! It's another "recession Christmas" for most people but I'm not going to let this financial challenge get in the way of my gift giving this holiday season! So, get ready my friends for your "living gifts" from the garden. Here are seven of my favorite projects and crafts that I've culled from past Eden Maker blog posts to inspire you! I put together this mixed lettuce bouquet from my garden as an unconventional hostess gift. I picked the lettuce thirty minutes before leaving the house to preserve as much freshness as possible. The lettuce leaves were washed and rolled in a moistened paper towel and aluminum foil. 2. Palm Frond Recycled as a Succulent Planter! Is the wind blowing palm fronds onto your street? Don't be so fast to throw away this debris. I was impressed with some clever succulent planters that were created by a group of Los Angeles Arboretum volunteers using re purposed natural materials like palm fronds and hollowed tree stumps..
Read the rest of the post "Succulent Planters: Would You Believe Palm Fronds? This succulent pillow is a Shirley original, as far as I know, (a vision came to me for it while watching Citizen Kane ). I created the "Living Succulent Tapestry Pillow" for my presentation at the "Epcot International Flower and Garden Show" in Disney World last year. Read the rest of the post "Living Tapestry Pillow"
4. Miniature Rose Garden in a Container! What do you do with those cute miniature roses that you can buy at the supermarket, big box store or discount outlet? Take them out of their pots and make them the star of a container miniature rose garden! Read the rest of the post "Create a Miniature Rose Garden in a Container!" Hanging onion basket repurposed as edible garden container! This hanging, edible container garden makes a great gift. Re-purpose kitchen items that can handle water as containers for planting herbs, like this onion hanger from the "Dollar Store." Read the rest of the post "Edible Gardening Containers from the Dollar Store" for more ideas like this. 6. "Antique Dresser Re-purposed as a Potting Table!" Upcycle an antique dresser as a potting table! Are you handy with a paint brush? Here's an idea from one of my garden makeover segments on HGTV. An antique dresser can make a great potting table. Read the rest of the post "Garden Furniture as Art!" for a few other clever gift ideas for the DIY'er to make. Plants are inexpensive and mixed with "garden sculptures" or re-purposed decor, they can be transformed into an artistic, one-of-a-kind gift! Read the rest of the post "Container Gardens That Catch the Eye!" for more ideas like this. I hope some of these ideas provide a stimulus for your own creative gifts from the garden! Thanks for reading and I invite you to watch my weekly, online Garden TV talk show, "Garden World Report." The latest Garden World Report Show is called, "Garden Center Holiday Tour" and features tours of garden centers all over the country decked out for the holidays and more! 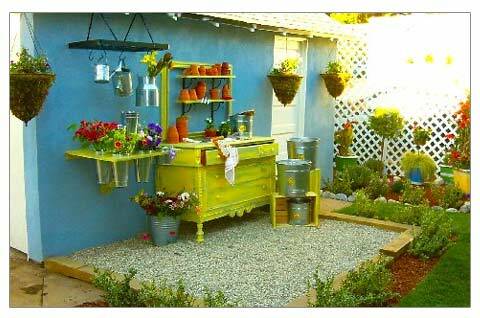 I LOVE the repurposed potting bench along with everything else in that entire potting area. Who wouldn’t love to dig in the dirt surrounded by that delightful setting?!! I also appreciate the shelf with cut flowers hanging on the wall. Great way to take advantage of vertical space for anyone with a small gardening space. Check out my Tipsy Pots Tips and video for another vertical planting idea in small spaces. Thanks Susan! The reason you having seen the flower arranging table is because it’s a “Shirley Original!” I designed it especially for the homeowner in the HGTV makeover show I did. She loved creating flower arrangements so I designed it custom for her! I’m so glad you like it. Great ideas, Shirley. I especially like the mini rose garden with a little trellis, and I’ve never seen the flower-arranging table before. I have seen furniture repurposed as potting tables, but I really like the flower bucket table next to it! Thanks for visiting and commenting. I’m always amazed at the beautiful garden decor that can be created from “throw away” materials. I just visited your blog and enjoyed it. These are all fabulous ideas! I really love the palm frond succulent planter, it is very stunning. Such a different look than the normally horizontal pots of succulents. The vertical height truly catches your eye. Great post and ideas.